A customer had a requirement for setting a week number for approximate delivery of purchased goods on shipment as an indication for the sales department of when the goods will be arriving. An integer field had been introduced on the table in question, and the customer wanted to be able to do a lookup in the standard calendar, but wanted a week number to be returned in stead of a date. For the field that was to contain ETAWeek there was an Extended Data Type called ETAWeek. In the Form SysDateLookup I added a boolean variable in Classdeclaration. 3. In the Form SysDateLookup - method init I added check to see if the SysDateLookup form was called from an integer form control. 4.In the Form SysDateLookup - method closeSelect I added an extra else if block in the bottom to handle returning the week number. Now the SysDateLookup works for the ETAWeek field. UI design wise you can set the "ButtonImage" property on the Extended Data Type ETAWeek mentioned above to the value Calendar to get an calendar icon beside the field. Today I had some trouble getting a normally simple thing to work in an AX form. The form consists of to synchronized grids, and the user wanted an "Export to Excel" command button, so the active grid can be exported to Excel. Normally this is very simple as you just need to add a command button to the form in the ActionPane somewhere and you're home free. Not this time. It didn't work. and put a breakpoint in the performPushAndFormatting method. I didn't reach my breakpoint and Excel didn't even start. Then I started to investigate the form. Maybe the tables of the datasources of the form had some obscure property that needed tweaking, but no. After pondering this for a while I found that the designer of the form had dropped a field group containing all the fields in the grid. Could that be the problem ? Clearing the "DataGroup" property of the field group, allowed for dragging all the fields from the field group to the Grid node in the design, and presto, the Export button now worked like a charm. Lesson learned. If you have a grid in your form, and you want to be able to use an "Export to Excel" command button, using field groups in the grid is a bad idea. I experienced this on a Dynamics AX 2012 R2. A classical developer challenge in Dynamics AX is to enable a form button when multiple records have been selected in the form by the user. This usually involves writing some form of loop (for or while or do-while) that starts out with calling _ds.getFirst() and continuing the loop as long as _ds.getNext() returns a tablebuffer. Well things got a little bit easier in AX 2012. In AX 2012 you can use the MultiSelectionHelper class. Print/Post collection letters form (Accounts receiveable / Periodic / Collections / Print/Post Collection letters). 1) Change the "Multiselect" property of the "MenuButton" and the "Menuitembutton" in the MenuButton in the form from "Auto" to "Yes". 2) Change the CustCollectionJourController used to run the report to handle multiselected records from the form. 2.1) A new method "isMultipleSelected" was added to the class. The method is takes the args passed from the menuitem / form and checks if it is a SysSetupFormRun object. If it is a MultiSelectionHelper object is instantiated. This can help traverse the selected records in the datasource, and we simply traverse it until we're certain that more than one record is selected. Valid Time State tables are new i AX 2012 a gives the developer the possibility to easily create tables that hold e.g. current setup data for various purposes, and at the same time keeping a "history" of the changes of the data in the table. I was tasked with doing a setup table with rates for calculating Vendor Bonus and I chose to base this a valid time state table. The customer asked for a button on the form, where you maintain the vendor bonus calculation setup data, so you could toggle viewing "Current setup" or "All setup" records (changing the view from actual to all records and vice versa in the form). containing which "kind" of view is currently used in the form. I encountered a strange little quirk when I was testing using jobs that made lookups on my table. Microsoft has introduced a keyword for the select command called validTimeState which is used for specifying on which date you want to select records from the table. This will simply not compile. which I personally think is a bit weird. Being in a situation where I needed to determine if a certain AOT-element was included in an installed model, I wonder why Microsoft didn't link the form showing installed models (Help / About Microsoft Dynamics AX / (link) Show installed models) or (Tools / Model management / Models installed) with the form showing Elements in installed models (Tools / Model management / Model elements. Opening the About Dynamics AX form you are able to access the list of installed models in the application, but you can not drill down to the elements included in the model. You'll have to go to the other form and make a filter to view the elements in a model. So I quickly made the attached code project, which simply adds a button (Elements) to the Installed models form, so that you can see a list of the elements included in the model. In the element list you can open the cross reference for each element, to make further drill down as to which elements are using the element included in the installed model with the button (Used by) which opens the cross reference for the chosen element. Be aware however that the cross reference form might "hide" behind the Model windows as it is workspace Window. As always - use at own risk. 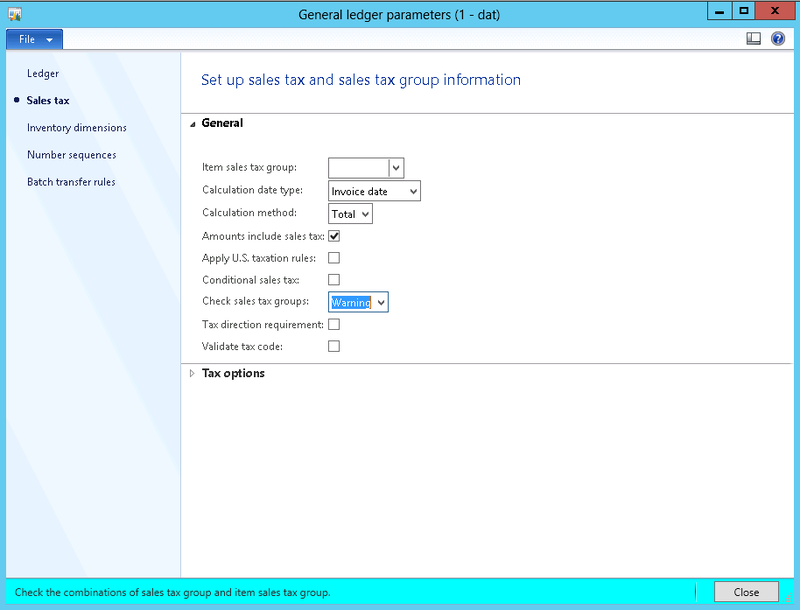 In Dynamics AX 2012 if General Ledger module is setup to validate Check sales tax by entering either "Warning" or "Error" in the "Check sales tax groups" field, then Dynamics AX will throw an error (stop execution) or issue a warning in the infolog if it encounters a tax setup error when doing calculation of tax. As you might know the tax calculation is based on getting the intersecting tax codes connected to the item tax group and the tax group of a given source document line. In this case I encountered we wanted to diagnose the origins of the error, because the error occurred when changing a customer group, which we thought was a bit odd. Digging a bit deeper, the error was not related to changing the customer group, but instead related to the following recalculation of credit limit on the customer that Dynamics AX wanted to perform. I traced the error to the class Tax and the method insertInterSection. Seing that the Tax class is a super class the reason for the not very informative error message became clear. The insertIntersection method is inherited by the sub classes in the Tax class hierachy and therefor contains logic that is not module specific, so there are no references to the origin-lines (e.g. sales lines og purch lines) that the tax group set up comes from. The method attempts to evaluate a generic tablebuffer to determine what is the source of the tax codes being evaluated, and which cause an invalid combination. It does so by instantiating a DictTable object using the table id found in the tax class (this.sourceTableId()). It then does a call to the kernel method makeRecord() on the same object to get a tablebuffer. The we do a select firstonly on this tablebuffer using the recid in (this.sourceTableId()) to get the record that is the origin of the tax groups. The it evaluates the table id of the found record and constructs and error message text, that can be post fixed to the standard error message. construct which actually let's you access the fields of a common table buffer. effectively adding more info to the error message. This way I was able to pinpoint the source of the problem: An open sales order line on the customer we edited was missing an item tax group. Etiketter: Dynamics AX 2012 invalid tax code combination - tracing of cause.